An FIU visitor gives the Grand Longina a spin. If you took a seat in front of Deuxieme Maison (DM) today, you might notice something different. A 12′ x 4′ stainless steel sculpture featuring sleek curves, defined edges and a reflective spinning ball in its center – the Grand Longina. Installed in December 2018 for Miami Art Week, Grand Longina is the signature piece in the Longina sculpture collection currently on display in the Gallery at Green Library. The front of the DM building is no stranger to art. It was once the home of the beloved Marty’s Cube, which legend had it brought good luck if spun 24 hours before an exam. Nothing could ever replace Marty’s Cube, but with its bold colors, statuesque form and slightly risqué design, Grand Longina is a force all its own. 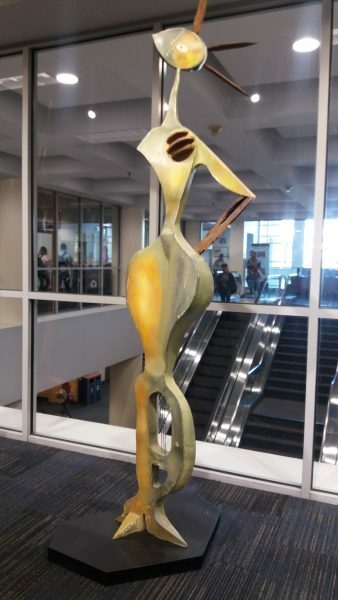 Procured by the FIU Libraries Special Collections department, the Longina art exhibit gets its name from the song that inspired the sculpture series – a 1918 hit produced by famed Cuban composer Manuel Corona. The exhibit was designed and created by local artist Armando Perez Aleman, a Cuban-born architect turned sculptor known in the South Florida community for his culturally infused steel and bronze pieces, which he refers to as “intimate reflections” of his life. A passionate supporter of preserving Cuba’s rich culture and history, Armando dedicated the proceeds from booklets sold during Longina’s opening reception to FIU’s CasaCuba initiative. Armando continues to sell the Longina booklets with hopes to further his contribution to CasaCuba and its efforts. Time is running out to see the Longina exhibit (it leaves the Green Library Jan. 19), but the Grand Longina will be sticking around. Where did the Marty’s Cube go?